TORONTO — The Toronto International Film Festival® adds 7 Galas and 17 Special Presentations to its highly anticipated 2014 lineup. Audiences can expect a robust slate of international titles and diverse genres representing works from around the globe. Festivalgoers will be among the first to see new films by directors Johnnie To, Michel Hazanavicius, Olivier Assayas, Benoît Jacquot, Lynn Shelton, Jean-Pierre and Luc Dardenne, and the latest onscreen appearances from Arnold Schwarzenegger, Catherine Deneuve, John Travolta, Jean Dujardin, Juliette Binoche, Morgan Freeman, Marion Cotillard, Neil Young and Kristen Wiig. The 39th Toronto International Film Festival runs from September 4 to 14, 2014. An orphaned 12-year-old boy is sent to prestigious music school where he struggles to join an elite group of world-class singers. No one expects this rebellious loner to succeed, least of all the school’s relentlessly-tough conductor who wages a battle of wills to bring out the boy’s extraordinary musical gift. Starring Dustin Hoffman, Kathy Bates, Josh Lucas, Kevin McHale, Eddie Izzard, Debra Winger and Garrett Wareing. Marseille, 1975. Pierre Michel, a young police magistrate with a wife and children, has just been transferred to help crack down on the city’s organized crime. He decides to take on the French Connection, a Mafia-run operation that exports heroin all over the world. Not paying heed to any warnings, he leads a one-man campaign against Mafia kingpin Gaëtan Zampa, the most untouchable godfather of all. But Pierre Michel soon discovers that to get results he will have to change his methods. Starring Jean Dujardin, Gilles Lellouche, Céline Sallette and Benoît Magimel. Young surfer Nick thinks all his dreams have come true when he visits his brother in Colombia. Against an idyllic backdrop of blue lagoons and white beaches, he falls madly in love with Maria, a beautiful Colombian girl. It all seems perfect until he meets her uncle, Pablo Escobar. Starring Benicio del Toro, Josh Hutcherson and Claudia Traisac. A former art prodigy and second generation petty thief buys his way out of prison to spend time with his ailing son. To do so, he must team up with his father for one last job to pay back the syndicate that arranged his release. Starring John Travolta, Christopher Plummer, Tye Sheridan, Jennifer Ehle, Marcus Thomas, Anson Mount, Abigail Spencer and Travis Wade. Set in the late ’70s, a manic-depressive mess of a father tries to win back his wife by taking responsibility of their two young daughters. The spirited girls don’t make the overwhelming task any easier. Starring Mark Ruffalo, Zoe Saldana, Imogene Wolodarsky, Ashley Aufderheide, Beth Dixon and Keir Dullea. Overeducated and underemployed, 28-year-old Megan is in the throes of a quarter-life crisis. Squarely into adulthood with no career prospects or motivation to think about her future, Megan is comfortable lagging a few steps behind while her friends check off milestones and celebrate their new grown-up status. When her high-school sweetheart proposes, Megan panics and — given an unexpected opportunity to escape for a week — hides out in the home of her new friend, 16-year-old Annika, and her world-weary single dad Craig. A romantic coming-of-age comedy about three people who find their lives intertwined in the most unconventional of ways. Starring Keira Knightley, Sam Rockwell and Chloë Grace Moretz. Based on Jill Ciment’s novel, Heroic Measures. Ruth & Alex is set over a weekend where a couple (Morgan Freeman and Diane Keaton) must decide whether or not to sell their Brooklyn walk up of 40 years. The story takes a comedic turn when the dynamic couple have to contend with eccentric open house guests, their pushy realtor niece, and the health of their beloved family dog — all while navigating a New York on edge from what turns out to be an media-generated terror threat. Noni is the music world’s latest superstar, but the pressures of fame have her on edge — until she meets Kaz Nicol, a young cop and aspiring politician. Can Kaz’s love give Noni the courage to find her own voice and become the artist she was meant to be? Starring Gugu Mbatha-Raw, Nate Parker, Minnie Driver, Colson “MGK” Baker and Danny Glover. At the peak of her international career, Maria Enders is asked to perform in a revival of the play that made her famous 20 years ago. But back then she played the role of Sigrid, an alluring young girl who disarms and eventually drives her boss Helena to suicide. Now she’s asked to step into the role of the older Helena. She departs with her assistant to rehearse in Sils Maria, a remote region of the Alps. A young Hollywood starlet with a penchant for scandal is to play the role of Sigrid, and Maria finds herself on the other side of the mirror, face to face with an ambiguously charming woman who is, in essence, an unsettling reflection of herself. Starring Juliette Binoche, Chloë Grace Moretz, Kristen Stewart and Lars Eidinger. Max Simkin repairs shoes in the same New York shop that has been in his family for generations. Disenchanted with the grind of daily life, Max stumbles upon a magical heirloom that allows him to step into the lives of his customers and see the world in a new way. Sometimes walking in another man’s shoes is the only way one can discover who they really are. 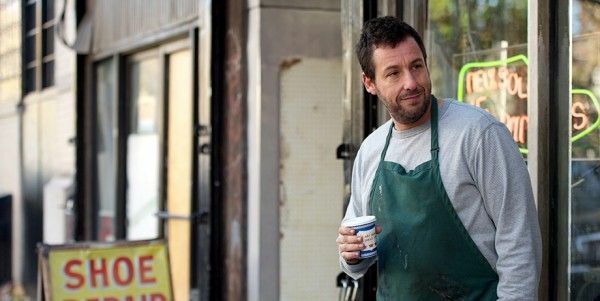 Starring Adam Sandler, Cliff “Method Man” Smith, Ellen Barkin, Melonie Diaz, Dan Stevens, Fritz Weaver, Yul Vazquez, Steve Buscemi and Dustin Hoffman. After losing his girl in a love triangle, Shen Ran falls in love with another woman, only to find himself still attached to his old flame. Meanwhile, his new love also finds herself torn between him and another young man. Starring Louis Koo, Miriam Yeung, Gao Yuanyuan and Vic Chou. Martin, an ex-Parisian well-heeled hipster passionate about Gustave Flaubert who settled into a Norman village as a baker, sees an English couple moving into a small farm nearby. Not only are the names of the new arrivals Gemma and Charles Bovery, but their behaviour also seems to be inspired by Flaubert’s heroes. Starring Gemma Arterton, Fabrice Luchini, Jason Flemyng and Niels Schneider. Beaten, bruised and afraid, young author Klas Östergren hides out in a Stockholm apartment, writing the story of its vanished inhabitants: the flamboyant, charismatic, enigmatic Morgan brothers. Gentlemen simultaneously celebrates and mourns the post-WWII era — its liberation, wild jazz music and poetry, economic boom and rampant corruption. Starring David Dencik, Ruth Vega Fernandez, David Fukamachi Regnfors, Sverrir Gudnason, Boman Oscarsson and Pernilla August. This is the inside story of the Camorra, the fierce Neapolitan crime organization, told through the eyes of 30-year-old Ciro, the right hand of the clan’s godfather, Pietro Savastano. The road to the ’80s is reflected through the hi-tech, fantasy lens of Neil Young’s 1982 film, Human Highway. This absurdist comedy-musical deals with one of the most serious issues of our time: the threat of nuclear destruction. Starring Dean Stockwell, Neil Young, Devo, Russ Tamblyn, Dennis Hopper, Charlotte Stewart, Sally Kirkland and Geraldine Baron. A Midwestern farmer stays by the side of his beloved teenage daughter even as she slowly turns into a cannibalistic zombie, in this daring, genre-bending debut feature from director Henry Hobson. Starring Arnold Schwarzenegger, Abigail Breslin and Joely Richardson. Inspired by an extraordinary true story, Pride follows a group of gay and lesbian activists who come together to support the families of striking mine workers in 1984 England. As the strike drags on, the two groups discover that standing together makes the strongest union of all. Starring Bill Nighy, Imelda Staunton, Dominic West, Paddy Considine, Andrew Scott, Joseph Gilgun, George MacKay and Ben Schnetzer. In the vein of crime classics like Mean Streets and Infernal Affairs, this film follows two immigrant friends, Sonny and Steven, who survive the hard streets of New York in the 1980s by joining Chinatown gang The Green Dragons. Sonny and Steven quickly rise up the ranks, drawing the unwanted attention of the city’s police force. Starring Ray Liotta, Justin Chon, Kevin Wu, Harry Shum Jr., Shuya Chang and Geoff Pierson. The Second Chechen War, 1999. The Search recounts a powerful story of conflict told through four lives that will be brought together by a shocking twist of fate. Starring Bérénice Bejo, Annette Bening, Maxim Emelianov, Abdul-Khalim Mamatsuiev and Zukhra Duishvili. Hannah and Tahir come from two different worlds. But when their lives intersect, they’re at the same place: homeless on the streets of New York. A love letter to the great New York dramas of the 1970s, Shelter is an unsparing story of loss, love, sacrifice, redemption and ultimately, hope. Starring Jennifer Connelly, Anthony Mackie. One night in a French provincial city, Marc meets Sylvie. They wander the streets until morning and set a date to meet in Paris a few days later. When Marc doesn’t show up on time a twist of fate leaves him romantically torn between two sisters. Starring Benoît Poelvoorde, Charlotte Gainsbourg, Chiara Mastroianni and Catherine Deneuve. Sandra has only one weekend to visit her colleagues and — with the help of her husband — convince them to sacrifice their bonuses so she can keep her job. Starring Marion Cotillard, Fabrizio Rongione, Pili Groyne and Simon Caudry. A woman with Borderline Personality Disorder wins the Megamillions lottery, quits her meds and buys herself a talk show on an infomercial channel where she talks and creates segments exclusively about herself. This movie is a dark comedic look at our obsession with celebrity and narcissism. Starring Kristen Wiig, James Marsden, Jennifer Jason Leigh, Wes Bentley, Tim Robbins, Joan Cusack and Linda Cardellini.